Nearly 50 people are attending this year’s John Child Bryophyte and Lichen Workshop in Ohakune. 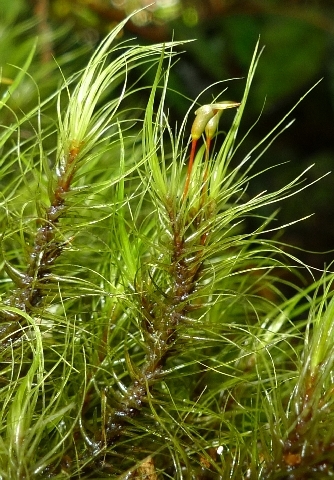 Bryophytes include mosses and liverworts. The Workshop is a focussed opportunity to study these small plants. Although usually overlooked, they actually make a huge contribution to forest biomass and functioning. Mosses and liverworts reproduce by spores, as do ferns. Spores are also part of the life cycle of seed plants (including conifers and flowering plants), but they also produce a more specialised structure that we’re also more familiar with – their seeds. Bryophytes, liverworts, ferns, and lichens all do not produce seeds. In mosses, the spores are made in a capsule that is usually held on a thin, wiry stalk. Dicranoloma mosses are one of the forest-dominants in New Zealand. They are not big (although they are quite big for a moss), but they are very common. This is Dicranoloma menziesii. Photo Leon Perrie. © Te Papa. Achrophyllum quadrifarium and its relatives do not have the narrow, spirally-arranged leaves typical of mosses. However, the spore-producing structures clearly identify this as a moss. Photo Leon Perrie. © Te Papa. 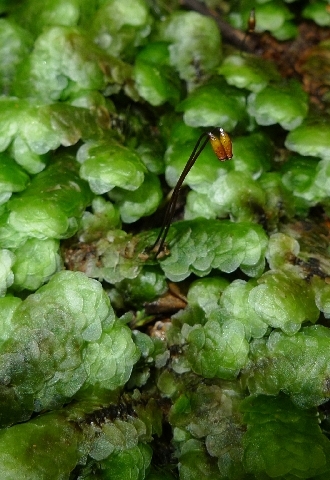 In liverworts, the spores are made in a capsule that is usually held on a thicker, fleshy stalk. A so-called leafy liverwort, Lepidolaena. Most liverworts, and many mosses, are usually found in damp, shaded habitats; I’ve taken this one to a sunny spot for a better photograph. Photo Leon Perrie. © Te Papa. Lichens are also part of the Workshop’s scope. Lichens are actually two (or more) organisms living together: a fungus, providing ‘shelter’; and a photosynthetic partner (an alga or a photosynthetic bacterium), providing ‘food’ by harvesting sunlight. 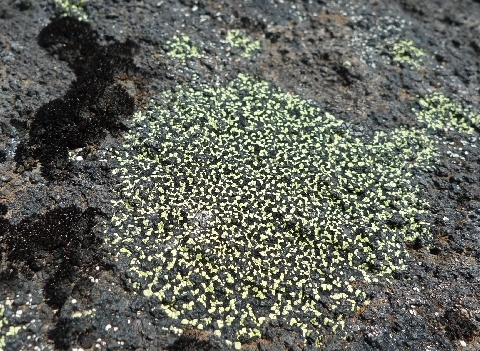 A crustose lichen, semi-embedded in the surface of a rock, high on Mount Ruapehu. The black patches at left are the moss Andreaea, an alpine specialist. Photo Leon Perrie. © Te Papa. Three of Te Papa’s botanists (plant scientists) are attending the Workshop. The Workshop allows us to share and extend our knowledge, and grow Te Papa’s botanical collections. 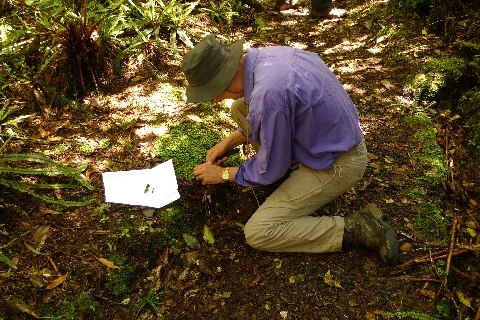 Te Papa Research Fellow Patrick Brownsey collecting a moss near National Park. The collected material is stored in an envelope folded from a sheet of A4 paper; each collection goes into a separate envelope. Photo Leon Perrie. © Te Papa. 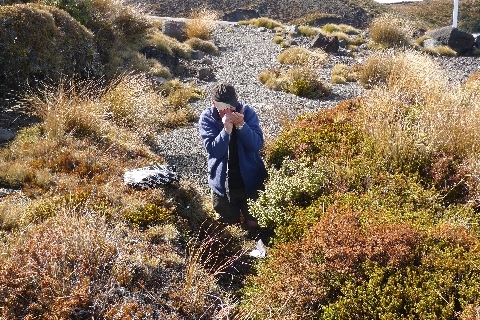 Te Papa Research Associate Peter Beveridge looking for liverworts on Mount Ruapehu. Peter is examining a collection using a magnifying hand-lens, an essential piece of equipment if working with these small plants. Photo Leon Perrie. © Te Papa. Before the Workshop in Ohakune, a small group including Te Papa’s team collected mosses, liverworts, lichens, and ferns from along the Forgotten Highway (State Highway 43) between Stratford and Taumarunui. Blog post on our Forgotten Highway fern collecting. In lichens, egg cells are separated, and each one growing individually and make algae and fungi separately. Then algae and fungi become symbiotic together. But in plants, egg cells are merged. The egg cells of algae and fungi, merged together in the zygote of the plant. When the growth of plant seed, in fact fungi and algae growth and building up the body of a plant. And any tissue of the plant, is a member of coexistence. Parenchymal tissues of the plant are the algae cells. Vascular tissue of the plant, are the fungus cells. There is much evidence for this theory. The hypothesis in your second and third-to-last sentences is new to me. You say there is much evidence, so feel free to post links to reputable sources, including peer-reviewed articles, so that others can learn more.